When I was a little girl, I dreamed of being a teacher. Probably in first grade, I knew when I I grew up, I wanted to teach. It was a passion. My bedroom door had a chalkboard on the back of it for my play school sessions. At Christmas time, “Santa Claus” brought me stickers, workbooks and stamps that said things like “Check your work!” and “Completed with help.” I subscribed to teaching magazines and was thus on the mailing list to read about my retirement options at the tender age of eight. My mom, a teacher’s assistant, would bring home extra worksheets from her classroom for my pretend teaching. My uncle, who was a special education teacher, always gave me a grade book and a plan book that look almost exactly like the grade book and plan book my school makes available for me each year. Oh, how I loved getting my little future-teacher hands on that plan book! It felt so, well, teacher-y! My relationship with the plan book changed when I became a student teacher and was expected to keep one. What exactly does one write in those small boxes? I recall sitting with my cooperating teacher and following her model, jotting page numbers and objectives. As a new teacher, I was required to hand my plan book in for our Assistant Principal to review. He would staple a little note, reminding me to check off lessons that were completed or saying “Nice job.” In time, my plan book stopped getting collected. Through the years, the once magical quality of a plan book dimmed and it now seemed bothersome, like a chore, and not an especially helpful teaching tool. Maybe it’s the demands on a classroom teacher- the feeling that you can never stop for a second and you never have enough time to accomplish all you have to get done. Stopping to even jot the objective feels like another tall order when you are already stretched so thin. 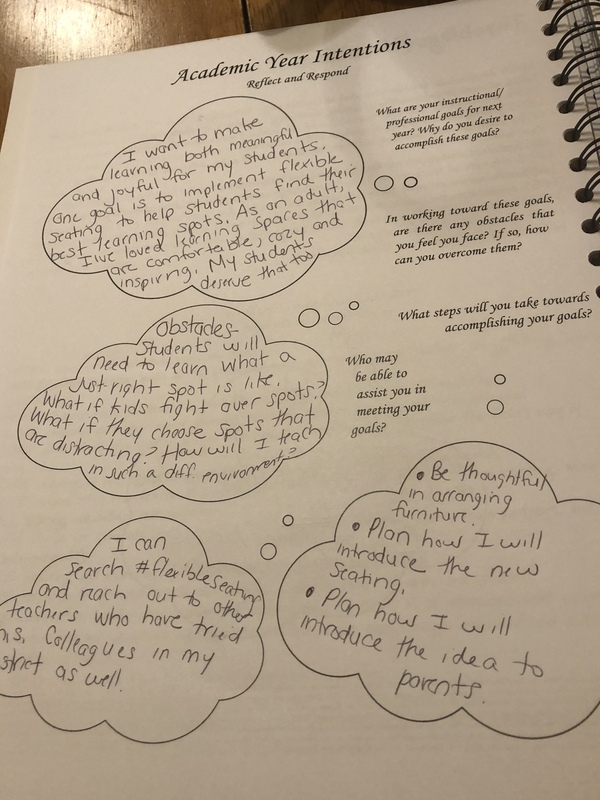 But, when I really stop and think about a plan book, despite the fact that I am supposed to be keeping one, I know deep in my teacher heart that it is an important tool. It’s a place to record what you intend to do with your students and then what actually gets done. It’s a road map back when you might get a little lost in subsequent years (“How did I introduce personal essays?!). And, with Nicolette James’ Intentional Educator Planner, it’s a a place to reflect, to set intentions, to show gratitude, to look ahead, to be inspired. Last August, I shared the 2017-2018 Intentional Educator Planner, created by my friend and fellow educator Nicolette James. The planner had spaces for 5 periods each day, which typically is suitable for middle school and high school teachers. Nicolette has designed another planner in her Intentional Educator product line that is more geared towards elementary educators, with 8 boxes for teachers to use each day. 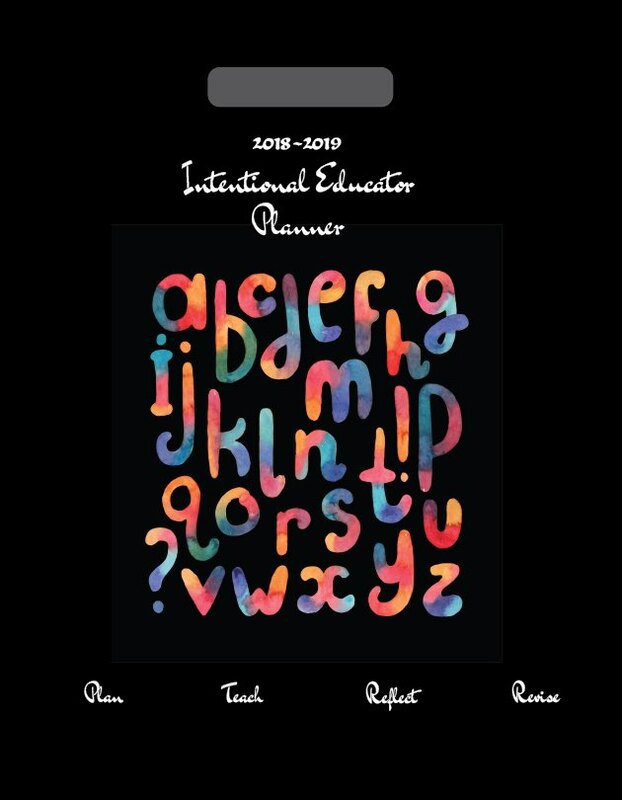 The 2018-2019 Intentional Educator Planner (Elementary) has two different cover options: Watercolor Alphabet or Blackboard Alphabet. You can see all of the Intentional Educator products here. Dr. Raye Wood reviewed the 2018-2019 Intentional Educator Planner (Elementary Edition) and you can learn more about the planner and her thoughts by watching the video below. Before the year even begins, there is a place to think about your academic year intentions. I always have a huge list of goals that I want to accomplish, but so many goals without true thought and reflection on how I will reach them means they largely go unrealized. Taking some time to think and write about my goals helped me clarify that meaningful and joyful learning is at the heart of what I want to accomplish this year. My classroom is piloting new furniture and a flexible seating environment. One of my goals is how to make this work for my students in a way that makes learning more joyful and meaningful for them. Listing the top ten things I want students to learn from me this year was a powerful exercise. I had to sum up what I believe and what I want to be sure my students take away from our time together. You can see my notes below. There is a plethora of choices when it comes to teacher plan books. You can take the standard one your school offers (just like the one that brought me such joy as a kid playing school!). You can select a fancy one or a cutesy one or even a digital one. The Intentional Educator Planner stands out to me because a real teacher, Nicolette James, designed it based on her own experiences as an educator working with students and teachers. It just feels like a plan book with integrity to me. It’s filled with beautiful and inspiring quotes and questions to make you pause in our chock-full, no time to slow down days. Maybe the problem is that we never slow down. How can we grow and be more intentional when we can’t even stop to think? This plan book gently reminds you to set intentions. To look for opportunities. To be thoughtful. To make plans to accomplish your goals. During this upcoming school year, I feel that little kid joy once again to have a plan book. The Intentional Educator Planner will help me find my love for plan books once again! Maybe you, too? This giveaway is for one copy of the 2018-2019 Intentional Educator Planner (Elementary). Many thanks to Nicolette James for donating a planner to one of our readers. 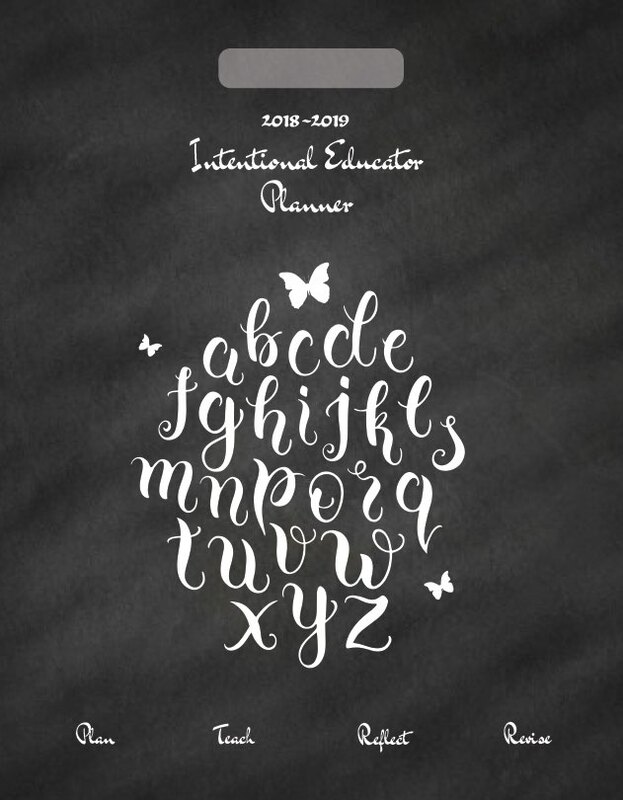 For a chance to win a copy of the 2018-2018 Intentional Educator Planner (Elementary), please leave a comment on this post by Friday, August 24th at 11:59 p.m. EDT. Kathleen Neagle Sokolowski will use a random number generator to pick a comment number, determining the winner. The name will be announced at the bottom of this post by Sunday, August 26th. If you are the winner of the book, Kathleen will email you with the subject line of TWO WRITING TEACHERS – INTENTIONAL EDUCATOR PLANNER (ELEMENTARY). Please respond to her e-mail with your mailing address within five days of receipt. Unfortunately, a new winner will be chosen if a response isn’t received within five days of the giveaway announcement. Congratulations to Lisa Ahlstrom for being the winner of our Intentional Educator Planner (Elementary)! Thank you everyone for your comments and enthusiasm for Nicolette’s amazing planner! Reading your article Kathleen was so much fun! My mom always tells everyone that I was born with a piece of chalk and an eraser in my hands, so I, too, have fond memories of “teaching” before I actually became a teacher. Your post reminded me of my early days “playing school” with the kids on my block as well! Like you, I’ve always wanted to be an educator and here we are–living our dream. Thank you for such a wonderful reflection on how you use my planner to plan and to reflect on teaching and learning. It is exactly what I hope to inspire other educators to do as this is important–very important–work and our goal should be to improve every time we step into our classrooms. I am so happy, heartened and excited about the response to the elementary planners this year!! I have published the 5-period version and a daily reflection journal for two years. This was my first year publishing the 8-period edition as well as a student planner–The Intentional Learner. As such, I didn’t publish many copies because I was unsure of the demand. However, it has been very positive. So positive, in fact, that the elementary planners have recently sold out for school year 2018-2019! I do still have several copies of the 5-period layout in various covers. Several elementary educators have used that version for the past two years and have found that it works well for them. Everything else in the planner is the same in both versions. Next year, I will be sure to publish many more copies of all versions!!! I will also be adding a new planner to the Intentional Educator line. It will be a Leadership Edition for those in supervisory positions. Lastly, as a department chairperson, I always start the year by asking the members of my department to think of the top 5 lessons they would love their students to learn from them. At the end of the year, I ask that they survey their students to find out from them what are the top 5 lessons they learned. We then reflect in writing and discussion on how the feedback will impact our instruction the following year. Doing so has made us all much more intentional, not only about what we teach but how and why we teach. As educators, we know that is ultimately what sustains us to continue this oftentimes challenging and wonderfully satisfying work. I wish everyone a fantastic school year 2018-2019! What a wonderful resource/tool for promoting professional and personal growth! Where can the elementary and middle school versions be purchased online? These cannot be found on Amazon. There is so much to love about a planner like this one. Count me in! For what it’s worth, though, Amazon only has the secondary planners available for sale. I’ve contacted someone on the product showcase page, so I’m also hoping there is an avenue open for purchase. Has anyone else had any luck? Love this amazing opportunity! Thank you for sharing this information! i’ve been trying to be more intentional in my lesson planning this year. As I plan beginning of the year activities for each one I ask myself – why? What is the purpose of this? What will the students gain from this? I love the tabs and the places for reflection! It’s easy to get caught up and forget to reflect! I am currently writing in a notebook as well as my planner. I would like to have one location to put it all. A reminder in my planner to look for opportunities is wonderful. Would love to win this planner and be rejuvenated about composing lesson plans! I want them to be purposeful for myself and my students, not just paperwork to turn into the office. I love the way it is set up and the spaces for thinking and goal setting. Thanks for sharing! Love the set up of this and the reflection piece before school and after. We get so caught up in the day to day schedule of school and forget sometimes how important reflection is and how helpful it can be. Thanks for the chance! Thanks for sharing and for the giveaway. I actually use one of the student agendas that my school gives out as my planner. Your post has me thinking that maybe I need to be more intentional! I love the 10 things I want my students to learn from me! I also appreciate the goal setting and reflection that is built into this planner! Thank you for creating a great resource with your blog!! We provide planners for our students and encourage them to be mindful and purposeful, why not teachers? I love that the days go across, rather than vertical. This looks like a great way to keep being intentional as the year gallops on. Thank you for sharing! 25 years in- still write lesson plans every week. Love this planner! This planner looks like it would make planning joyful! I love the idea of a planner made by an actual teacher. I love the idea of having a place to not only write my plans, but also to set goals and intentions for myself and my teaching. Thank you for the chance! As I enter my 23rd year of teaching, I can relate to the feeling that keeping a plan book can be a chore. This year I would like to be more mindful and intentional. Thank you for the reminder. I spent years (and my own $$) designing and printing my own planner from Staples! They never made sense to me without my own spin on them. Hope lots of teachers can get purposeful planning done with one of these! This planner looks like something I need to keep organized, motivated and reflective. I love the goal pages! I have tons of post-it notes and index cards taped all over my computer with goals and intentions, but having specially placed goal pages is an aw some idea. I love the idea of a planner containing a space to note goals, intentions and reflections. That is how we grow and improve our practice. LOVE! It is always great to try new ways to plan for the best instruction! Thanks. Wonderful reflective way to plan, thanks for the opportunity to receive one of these beautiful planners. BeautIful way to keep organized and reminded of lessons. Wow! 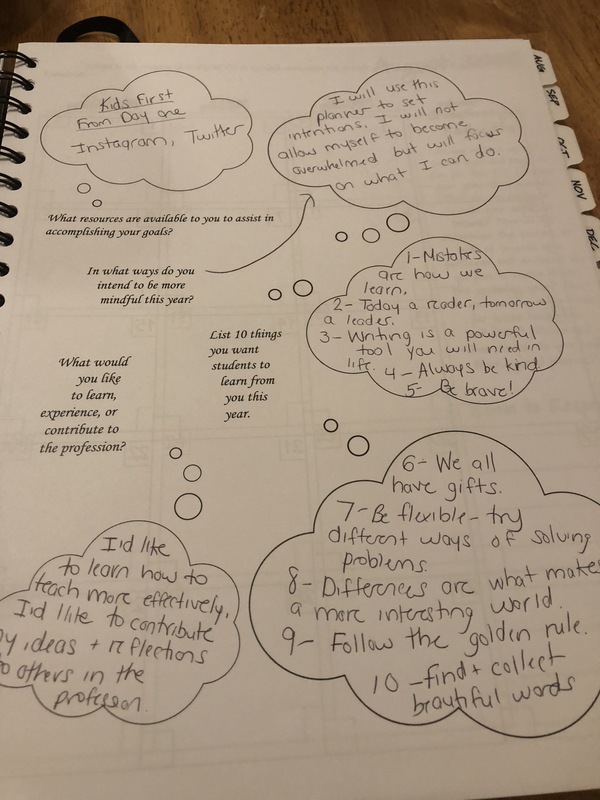 A planner that actually fosters reflective practices?! Yes! What an awesome idea! Thanks for sharing this resource. This planner is perfectly named. It’s intentional. I am pretty sure the “plan books” issued by schools were not designed by anyone who ever planned instruction or worked in a classroom. This would be amazing to give to one of our new teachers!!! The video tour of this planner was very helpful! I have kept every planner I’ve had since beginning my career in 2001.They are like diaries of my time with every student I’ve taught. It’s so fun to see how my planning has evolved over the years, and this planner seems like a great “next step” for me. Thank you!! I am starting a new job and a new planner would be wonderful to kick off the new year! Thanks for the chance to win! Such a great place to keep what you value as a daily reminder! I’ve been inspired by the idea of recording the top 10 things I want my students to learn from me. Thank you for the idea.